Russia is a strange, mysterious place that never fails to shock me, scare me and weirdly inspire me. 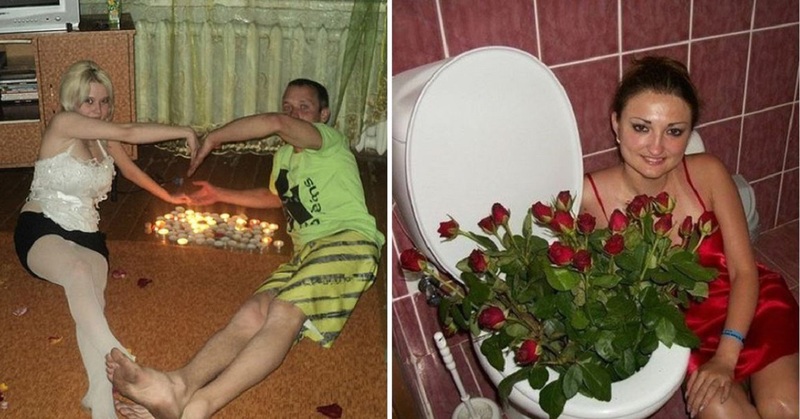 Well, Russia has done it again with some BIZARRE and disturbing glamour photos that are really quite worrying. I’m not sure if these photos are taken of women held against their own will and to be honest, I think they raise a few questions about the Russian glamour modelling world. Either way, these photos DEFINITELY need a backstory. Just by this woman’s expression you can tell she is regretting her life choices. I bet she’s thinking, “I was going to become an actress and now here I am, lying in a dirty puddle on the street in a bikini. WHAT WENT WRONG? !” I wonder what the passersby think, or are they just used to this kind of thing in Russia? This girl 100% decided to have a photoshoot halfway through tidying her room. Her outfit is ON POINT, definitely just picked random clothes off the floor and put them on. This is what classes as glamourous fashion in Russia. I think she should just finish tidying her room. 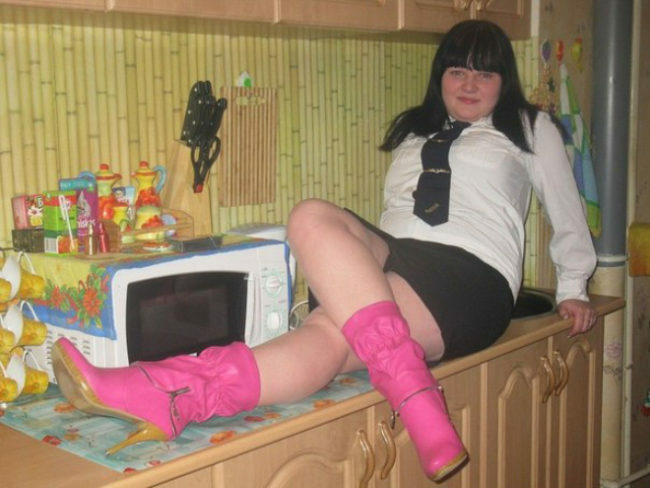 The microwave is known as being a brilliant modelling prop, also, those pink shoes are just SOMETHING ELSE. Why does every home look like it’s from the 70s in Russia? I have no idea what that drink is but it looks lethal. Also, the whole ‘pouring liquid over myself seductively’ really isn’t working out for this glamour shot, she looks awkwardly horrified. The only thing worse than the awkward model poses in this picture is the awful number of clashing patterns on the sofa and walls. MY EYES. I’m honestly stressed just by looking at these pictures. I think I need a lie-down. 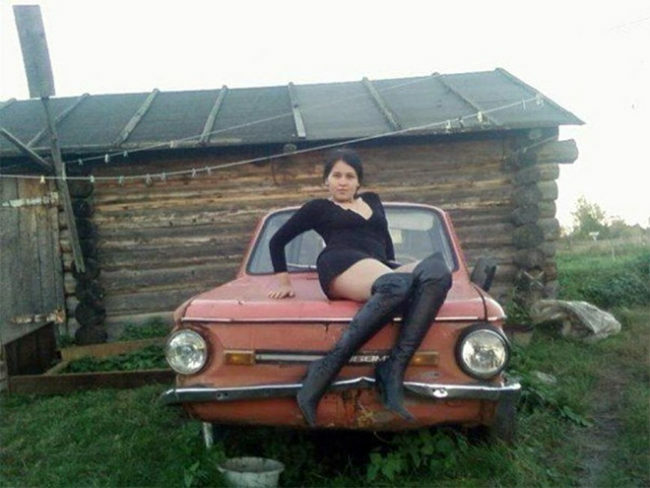 What is with these Russian glamour shoots taking place in the WORST locations?! The model looks PAINFULLY awkward whilst the shed backdrop really isn’t helping. Think both the photographer and model need new career paths. 8.) What is she doing? This model seems to like bathrooms as her location of choice. In the first one, it appears as though she likes to do the dishes in the tub which is HIGHLY unhygienic. The second one just is distressing. I’m not going to lie, this photo is just incredibly depressing. I guess the weather is usually like that but she really isn’t dressed for the occasion. She probably caught hypothermia after this. This glamour shoot is all about true love. 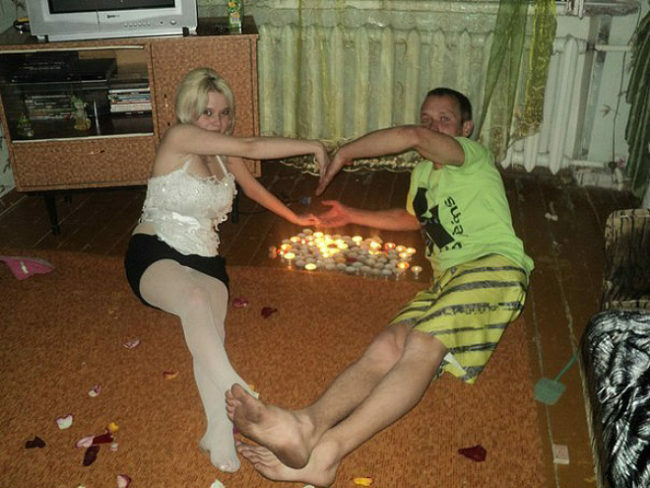 The candles coupled with the weird pose spells nothing but ROMANCE and is definitely NOT some kind of weird satanic ritual…someone get the holy water! If you were thinking of doing gymnastics in Russia, think again. You don’t want to end up having a sad photo shoot, regretting your life AND your disgusting patterned soft furnishing choices. I DEFINITELY need to wash my eyes out with bleach after this one. Imagine if her KIDS ever saw this, oh my. 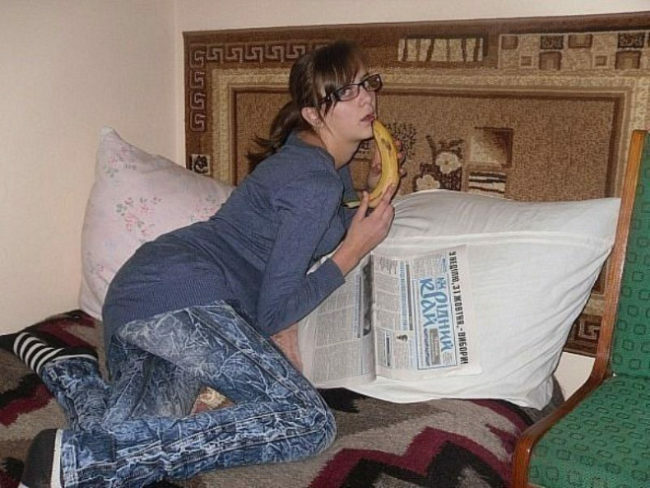 I mean, the banana is bad enough but what is WITH Russian houses loving terribly patterned duvets and rugs? It’s really bothering me. I was WRONG. She does exist and here she is! 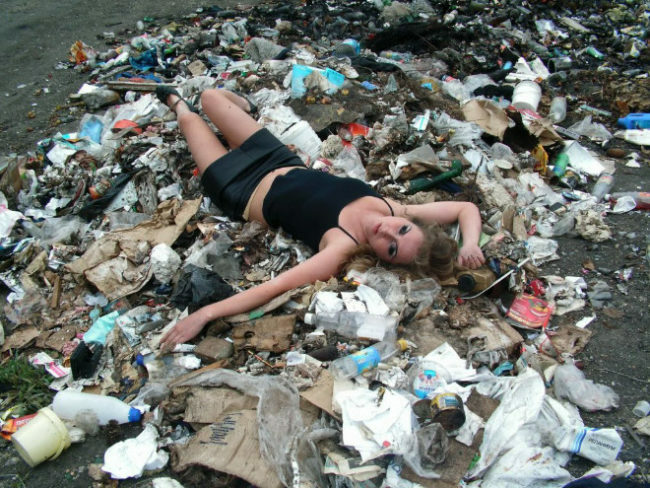 Don’t you love a woman that likes to dress up and lie in piles of rubbish while having her photos taken? To be honest, the piles of rubbish is still way better than those horrific patterned rugs Russian people seem to love. 15.) Who knew flowers could grow THERE?! This woman is a magician. 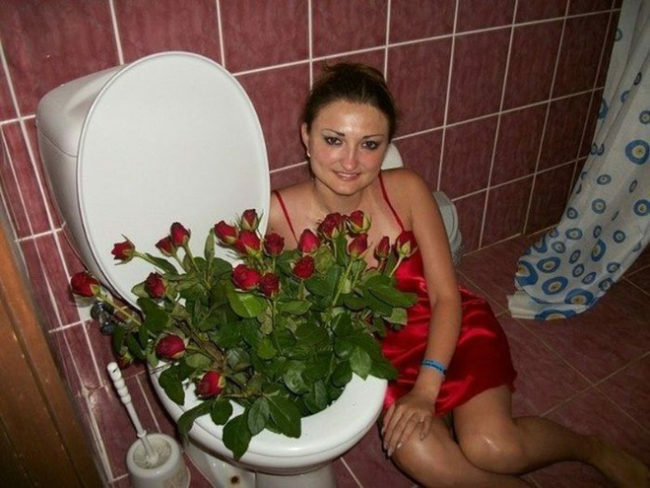 How did she manage to grow flowers out of the toilet?! I don’t trust her, her powers are way stronger than expected. So, I’m definitely moving to Russia to pursue my glamour model dream, they clearly have the best photographers around. Have a favourite? Let us know in the comments!